The booking system for sailing courses, canoe hire etc. Easy booking for thrills and chills? With bookingkit, your services are bookable from anywhere. Whether for white water rafting, canoe rides, sailing, surfing, skydiving or paragliding — with bookingkit, your customers are just a click away from the ride of their lives. Boost your exposure with bookingkit's extensive marketing network and provide your customers with a sense of calm before the storm of their choice. bookingkit provides you with everything you need to get your business up and running online and on mobile devices. No technical knowledge is required. The platform can be automatically integrated into your website in a matter of minutes, complete with your brand’s colors and fonts. Complete business management in a single software solution — that’s bookingkit. bookingkit is the all-in-one solution for automating your online business. The platform gives your customers the comfort and convenience of online payments in advance of their booked activities. 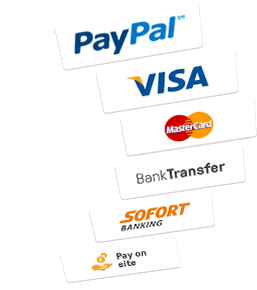 All standard payment methods are integrated in the system at no extra cost to you. 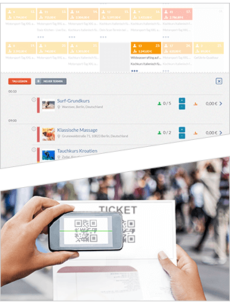 And bookingkit's convenient coupon management tool helps you significantly boost revenue with coupons available around the clock. The perfect gift for all occasions. bookingkit is complete business management in a single software solution: all your appointments, activities, bookings, requests and cancellations are always at a glance. Plus much more. If you’re always on the go, you need a solution that can give you the information you need quickly. 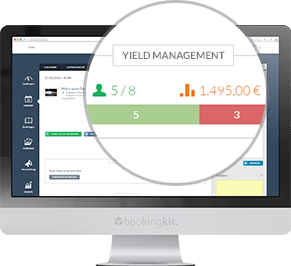 bookingkit provides customized revenue analysis that fits your business. Keep your capacities and utilization in view, conduct analyses and optimize your business whenever you need to. 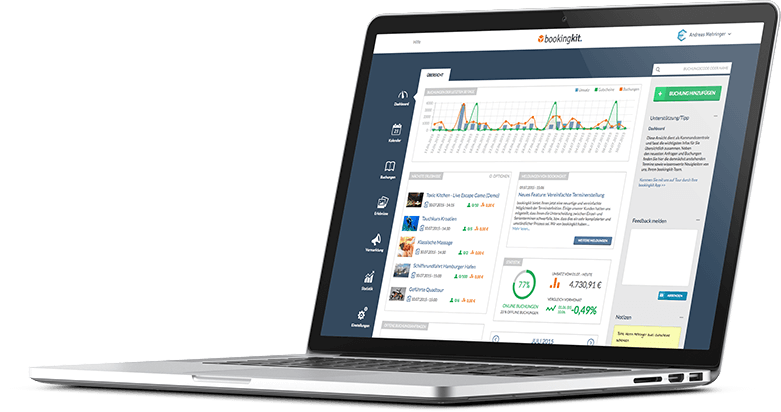 bookingkit gives you the tools to improve both how you market your business and how you manage your sales channels. Take advantage of our sales network to get in touch with 360 million potential customers each month. Market your business and services on our partner platforms — including TripAdvisor, EventimGuide and many others — to boost your exposure and bring in new target groups. Award-winning business management! 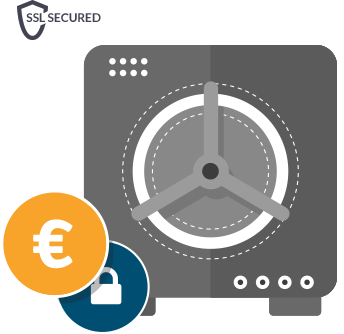 Put your business in safe hands with bookingkit. Unsurpassed analytics for capacity forecasting and optimization. bookingkit’s built-in analytics tools give you valuable insight into your business — from the big picture to the smallest of details. Capacity utilization, sales channels and revenue are evaluated and displayed in a clear and easy-to-understand layout. A quick glance is all it takes to know where your customers are coming from and which sales channels are bringing in the most business. All your essential metrics are right where you can see them, allowing you to quickly optimize your business and unleash the power of untapped potential. We are all passionate about our water activities – but less passionate about our paperwork. That’s why we are very happy to have found bookingkit. Bookingkit enables our customers to make online bookings and pay online. In that way, we can focus on what we’re really good at: providing our customers with a great watersports activity. We have less incoming phone calls and generate more revenue.